I have a Form 2 SLA printer from FormLabs and I’ve recently been experimenting with ways to print PCBs using the FormLabs High Temp resin (heat deflection @ 289 C). These PCBs can be printed in any shape, with holes for through-hole parts, vias, etc. There are a few challenges to the process. First, the dimensional accuracy of the PCB. Since the features on PCBs are very precisely placed for an Aligned Print on the Voltera, any variation in the dimensions over the length of the SLA print will make it impossible to later align the PCB for conductive ink printing on the Voltera. Second, the PCB must be perfectly flat, and SLA as a print technology is weakest when printing long, thin, flat sections (which unfortunately is a good description of a PCB blank); warping typically happens during the post-print “cure” phase where the part acquires its final strength, etc. The complication is that methods for achieving accuracy like printing directly on the SLA build plate are also those that lead to the most warping of flat, thin parts. In the method below I choose to rotate the PCB on one axis slightly; this seems to yield accurate parts but doesn’t completely eliminate warping. 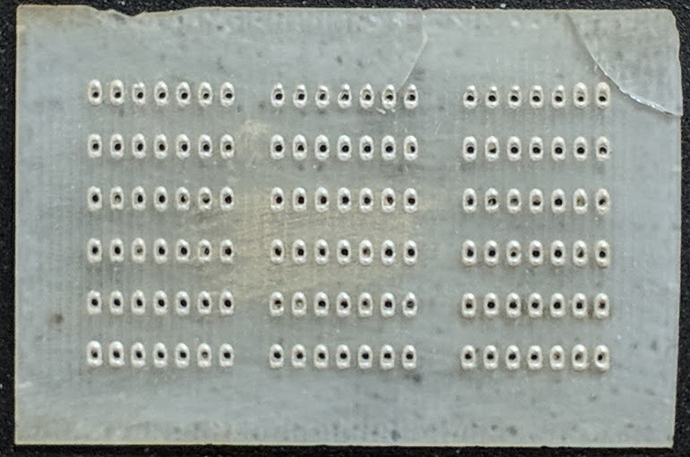 If you print a thin PCB directly on the build plate you’ll need some way of controlling the warping, and dealing with small < 0.6mm holes which may be filled in slightly on the side facing the build plate. Finally, though the HDT of High Temp is 289 C, flat thin parts will bend slightly under their own weight, so curing with the ink facing down isn’t possible. Also, High Temp resin was initially intended for injection molding processes, so it is very hard and thus very brittle; handling thin pieces requires great care (you can see from my photo that a moment of inattention broke off a corner). After many trials and errors, I have found a process that can produce a working part. It’s fairly labor intensive and requires careful handling. I’m still in the process of working out how to reduce final warping of the SLA part. Write a bit of OpenSCAD code to linear_extrude the imported SVG holes and difference() them with a cube() the size and thickness of the PCB you want to print; I recommend no thicker than 1.5mm and no thinner than 1mm (very, very fragile). Rotate the PCB STL in PreForm at 10 degrees on the long axis of your PCB (X or Y) and then generate supports (if you make the support base maximum thickness at 3mm you use more resin but reduce warping during cure). Open the Voltera software and select Heat -> Bake -> Next -> Start to start an hour baking cycle that should reduce/eliminate the warp; repeat if necessary or sand down any remaining warp at the edges. The High Temp resin has no off-gassing at the 240 C (that I could detect, anyway) so there should not be any fumes, etc. After you print your circuit on the High Temp PCB, bake the PCB with the ink side up; at 1.5mm thin the resin conducts heat well enough to bake the ink this way. Again, the resin will not create any fumes during baking. Note: If you use a resin other than High Temp, it may melt or warp badly, but it also may produce fumes that are unsafe, etc. so have an exhaust hood available. Is this worth doing? If you want a custom shape PCB, it might be easier to use a CAM to mill it to shape ahead of time. It’s theoretically possible to print indents or designs in the PCB, possibly even slots for small parts for easier placement; but at the moment the Voltera leveling behavior will cause the probe to dislodge and throw an error if it gets caught in any lower sections of the PCB, so it’s not possible. If you can figure out a way (using longer thumb screws?) to secure the part, you might be able to print a PCB on a thick substrate (appears that the Voltera vertical travel is at least 2 cm above the heating plate?) or other object, so that you have your PCB printed directly on a more complex part, something otherwise unachievable. Printing a thicker PCB (5mm thick or greater) should greatly reduce post-cure warping, but I haven’t tested this. Attached is a photo of a High Temp resin version of the Hand Soldering Practice PCB from Voltera. The fractures are a result of my clumsiness dealing with the very brittle material at 1.5mm. The patch of conductive ink in the middle is from the Voltera calibration (I learned later to place tape before running calibration). Very cool! I have a Form 2 as well and had been wondering about this. I’ve since been able to print really accurate PCBs that are flat and don’t warp by printing them with the edge facing the built plate. I’m using the new LT tanks which may make a difference. Anyway, if you place them on edge in PreForm and then set support generation to most dense (1.5) and generate supports, it’ll build a small raft with lots of supports, enough to hold the PCB on edge throughout the print. After printing they are perfectly flat, and remain that way after curing. One thing to watch out for is that the PCB can shrink when reheated by the Voltera, so if you have a multi step board (vias to bake and two sides) you might want to very slightly oversize the PCB to account for this, otherwise you won’t be able to align the board later. Great! Do you find that yields a flatter surface than printing a rectangle directly-on-base on a brand new build platform? Yes, printing perpendicular to the build plate produces a completely smooth, flat surface without any warping during cure. There’s no sanding required (except maybe the edge where the supports connected). The corners of the PCB are right angles and there doesn’t seem to be any distortion in the placement of holes, etc. I was able to ink a two-sided board with vias today, and confirmed the vias worked, etc. This was on a PCB with pre-printed through-holes and vias with the perpendicular arrangement. Actually I was thinking about using the surface that was directly touching the build platform. If it’s a fairly new platform (not scratched up) that surface is quite smooth and about as flat as the metal plate. You could sand it lightly to remove any fine marks if there are any. I’ve done quite thin transparent panels in Clear resin, directly on the platform, and pried them off with a razor scraper. Vias might be a little tricky as dimensions tend to “bleed” within the first few mm of the build platform. That said, I’m not surprised the vertical walls are producing your best results to date. You seem to get a better finish on them than exposed surfaces parallel to the platform. Awesome that you 3D printed your own two sided board! Glad to hear the High Temp resin held up to the curing. It’s neat timing as I contacted the Voltera guys about exactly this subject a few weeks ago. This is pretty interesting to me and I’d love to stay apprised of your work! I printed quite a few test boards with the board face directly on the build platform. They do come out very smooth, and can be taken off with a razor. There’s a small downside that any small holes are filled in on the side facing the platform. The bigger problem is that the boards warp during curing. You can fix this a bit by baking on the Voltera with a weight on it, and it will flatten somewhat. But ultimately, printing perpendicular to the platform and the wiper (so that the board face is parallel to the front of the printer) yields smooth dimensionally accurate boards that don’t warp. You have to generate supports and a raft; if you try to print with the edge directly on the build platform it will eventually detach during a peel and fail. Yep that’s what I meant by “dimensional bleed” ;-). You have to generate supports and a raft; if you try to print with the edge directly on the build platform it will eventually detach during a peel and fail. Makes sense. If you really wanted to print on an edge and avoid “wasting” resin on the raft, you could create custom supports (I’ve done a lot of that) but it probably isn’t worth the trouble. One last thing, I recommend using isopropyl alcohol when cleaning conductive ink from the resin PCB, it is otherwise very difficult to remove. In the process of creating more PCBs this way, I found it’s a good idea to bake a new high temp resin PCB substrate at least once prior to printing any conductive ink. If your PCB is two-sided you’ll essentially do this anyway when you bake the conductive ink filling the vias (assuming you’re not using rivets for your vias, that is). In any case, when you bake the high temp PCB the first time, place another PCB blank (FR4 or FR1) on top of it and either clamp the blank down or place a weight on it (I use a 200g weight I had sitting around). During the first bake, the high temp PCB may warp from the heat, and the PCB blank plus weight will prevent it from deforming and prevent small cracks from appearing in the surface. I’ve found that after the first bake cycle, subsequent bakes won’t cause the high temp PCB to warp.